Try this dairy-free vegan version of the classic comfort food from Modern Table! Made with simple gluten-free, non-GMO ingredients, the pasta is made from lentils, rice and peas to give you a protein-packed meal that's ready in a hurry. 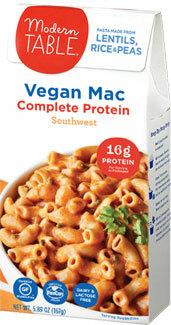 With a zesty Southwestern sauce that's sure to please, this vegan mac is a delicious powerhouse that everyone will love! Just add 2 tbsp. of your favorite buttery spread and 1/4 cup of your preferred milk alternative, and you'll be enjoying a bowl of delicious vegan mac in only 10 minutes. 5.89 oz. (167g) packages are $4.49 each. From Anonymous of Middlefield, Ohio on 4/6/2019 . Good, similar to the cheddar one but with cumin-like spices added. Docking a star for small serving sizes. Says 2, but I ate the whole box and still needed a small side.